Revealed about a month ago with some screens, Funcom's horror thriller The Park shows the first footage with this dev diary explaining what exactly the game is. It will be out later this month. Looks great, a little too short though, 1-2 hrs? And it's in first person. It might be worth looking at, still curios to see the reviews. 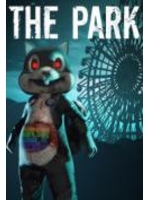 The video of the videogame, called "The Park." That seems extremely short. Especially considering how much the trailer was showing. Looked like there was plenty of material to make this game at least a few hours long. Also, seems a bit tacky to compliment your own character and game.